Strudels are the perfect blend of buttery puffed pastry and fruit. They're also super easy to throw together, even at the last minute. Lucky for us one of the most popular brands of puff pastry is vegan-friendly! In a large bowl combine the sugar, flour, cinnamon, nutmeg, allspice, and salt. Toss the apples with the orange juice, then add to the dry mixture. Toss until the apples are well coated, and set aside. Unfold the puff pastry and roll it out onto a lightly floured surface, to approximately 11 x 15 inches. Spoon the apples onto the dough forming a line down the middle. 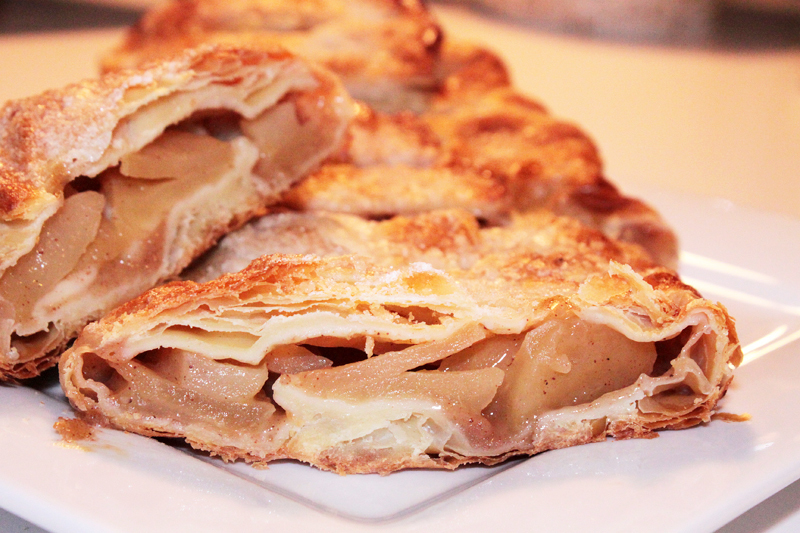 Fold one side of the dough over the apples, then take the opposite side and fold it over. Tuck in the ends. Brush the top of the strudel with the melted butter, then sand generously with sugar. Use a serrated knife to make several diagonal slashes along the top of the strudel. Bake for 30 - 35 minutes until the top is golden and puffy. Allow the strudel to cool for 20 to 30 minutes before slicing.